Dear Aspirants, Quantitative Aptitude plays a crucial role in Banking and all other competitive exams. To enrich your preparation, here we have provided New Pattern Aptitude Questions that are similar to the questions asked in IBPS PO Mains 2018. Candidates those who are going to appear in upcoming bank exams like IBPS Clerk, IBPS SO, etc., can practice these questions daily and make your preparation effective. The difference of difference is, 72, 62, 52, 42,…. The bar graph shows the percentage of profit earned by two different companies in different years. Quantity I: In 2018, total income of company A and B is 500 lakhs and the expenditure of both companies is equal. Profit of company B is 20 lakhs more than the profit of company A and the profit percentage of company A is 20%. Company A’s profit is what percentage less than the company B’s profit? Quantity II: Total income of company A and B in the year 2014 is approximately what percentage more/less than the total income of company A and B together in the year 2016? 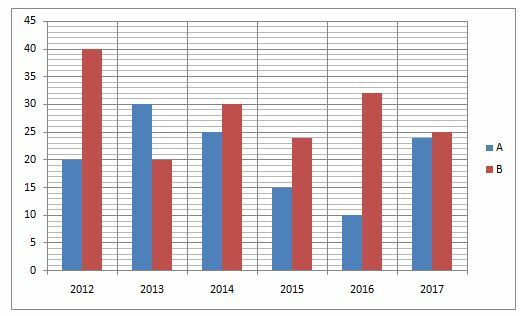 Quantity III: Total expenditure of company B in the year 2013 and 2014 together is what percentage more/less than the total expenditure of company A in the year 2012 and 2014 together? Which of the following should be placed in the blank spaces of the expression Quantity I__ Quantity II___Quantity III from left to right with respect to the above statements? 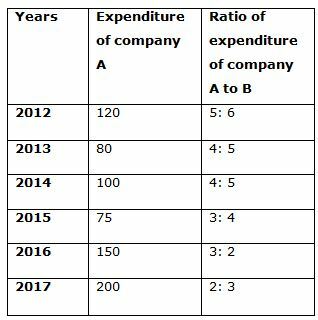 Quantity I: Find the difference of total income of company A in the year 2015, 2016 and 2017 together to that of total expenditure of company B in the year 2012, 2013 and 2014 together? Quantity II: What is the average income of company B in the year 2014 and 2015 together? Quantity III: In 2012, total expenditure of company A is 20% more than the previous year. The income of company A in the year 2013 is 20% less than the income of company A in the year 2011. Find the profit of company A in the year 2011? Which of the following should be placed in the blank spaces of the expression Quantity I __ Quantity II ___ Quantity III from left to right with respect to the above statements? Quantity I: In 2015, If the expenditure of company A is decreased by 25% and the income of company A is increased by 30%. Find the new profit percentage of company A? Quantity II: In 2016, If the income of company B is decreased by 20% and the profit is decreased by (x) %. Find the value of x, if the expenditure is same. Quantity III: Total income of company B in the year 2013 is what percentage more/less than the total expenditure of company A in the same year? Quantity I: In Company A, expenditure in the year 2012, 2014 and 2016 is increased by x %, (x+10) % and (x+15) % respectively. Find the new income of company A in the year 2012, 2014 and 2016 together, if the total expenditure of company A in the year 2012, 2014 and 2016 together after increment is 439.5 lakhs and the profit percentage is same as previous? Quantity II: In Company B, the income in the year 2013, 2015 and 2017 is decreased by 20%, 24% and 32% respectively. Find the new expenditure in the year 2013, 2015 and 2017 together if the profit percentage is same as previous? Quantity III: Find the total income of company B in the year 2014, 2015 and 2016 together? Which of the following should be placed in the blank spaces of the expression Quantity I__ Quantity II ___ Quantity III from left to right with respect to the above statements? Quantity I: Find the sum of the third highest and lowest income of company A in the given years? Quantity II: Find the sum of the second highest and second lowest expenditure of company B in the given years? Quantity III: Find the sum of the highest and second highest profit of company A in the given years? Which of the following should be placed in the blank spaces of the expression Quantity I__ Quantity III ___ Quantity II from left to right with respect to the above statements? 6) Quantity I: In 2018, total income of company A and B is 500 lakhs and the expenditure of both companies is equal. Profit of company B is 20 lakhs more than the profit of company A and the profit percentage of company A is 20%. Company A’s profit is what percentage less than the company B’s profit? 7) Quantity I: Find the difference of total income of company A in the year 2015, 2016 and 2017 together to that of total expenditure of company B in the year 2012, 2013 and 2014 together? 8) Quantity I: In 2015, If the expenditure of company A is decreased by 25% and the income of company A is increased by 30%. Find the new profit percentage of company A? 9) Quantity I: In Company A, expenditure in the year 2012, 2014 and 2016 is increased by x %, (x+10) % and (x+15) % respectively. Find the new income of company A in the year 2012, 2014 and 2016 together, if the total expenditure of company A in the year 2012, 2014 and 2016 together after increment is 439.5 lakhs and the profit percentage is same as previous? 10) Quantity I: Find the sum of the third highest and lowest income of company A in the given years?